A self-taught artist who lives in the mountains of southern Oregon, Mason felt from early childhood that she was an artist but initially chose the path of marriage, children and work. For many years art was an undercurrent in her day-to-day life and she took varied art classes when time and family demands permitted. Recently, with her children grown, she was able to retire and move art to the forefront of her life. As an accomplished sculptor Mason concentrates on figures of strong women experiencing deep emotion. Often Mason’s figures seem to have a Native American look about them. 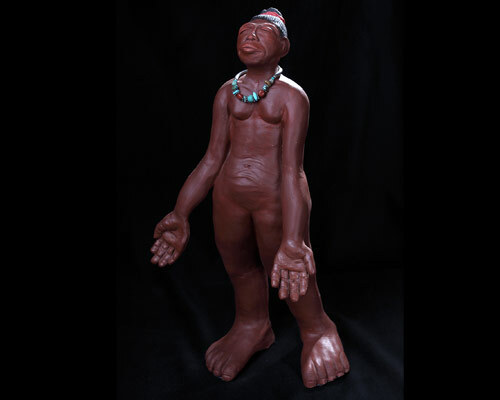 When asked about the Native American influence, she can only simply answer, “It’s who was in the clay.” She hopes to make the viewer smile when her sculpture is viewed. Mason loves many different types of art and continues to experiment. She thoroughly enjoys the peace found working in her studio and plans on continuing to develop her own artistic flavor. Currently Sheila Mason’s work is on display at the Southern Oregon Guild Gallery in Kerby, Oregon.